Artist baby names combine so many appealing qualities. Taking inspiration from a favorite artist adds meaning to a name choice. They feel original and creative, and their sounds? Undeniably on-trend. Most of the artist baby names on this list come from painters. Layer in photographers, architects, and creatives from similar fields, and the list is nearly endless. I’ve always been fascinated by Judy Chicago. But if I named my kiddo Chicago, you’d think of the Windy City or the sports teams, not The Dinner Party. And Judy to me is all Jetson, though I do find Judith striking. What a difference a Kardashian makes! Still, I’m not sure Chicago belongs with artist baby names any more today than it did then. While these are all surnames, there’s no reason to overlook artist-inspired first names. Gems like Jasper, Leonardo, Ansel, Georgia, and Paloma abound in the art world. But many of those feel at least slightly more familiar, and perhaps not as instantly tied to the artists. These nine artist baby names bring to mind the creative powerhouse that inspired them, but still feel wearable for a child today. Richard Avedon was one of the twentieth century’s most famous fashion photographers. He made his name at Vogue, but later in his career began to photograph Civil Rights workers and protestors opposed to the Vietnam War. 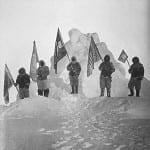 He photographed Marilyn Monroe, but also former president Eisenhower and poets Ezra Pound and Allen Ginsburg. It’s not a common surname, and I couldn’t trace down its origins. But Avedon appeals for a few reasons. 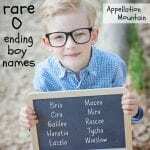 It fits with all of those Ava and Avery inspired rarities: Avonlea, Avalon, Aveline, Avila. But second, it seems like one of the few Av- names that really works for a son, an alternative to new favorites Sullivan and Donovan. Bonus? I think you could easily get the nickname Von or even Van from Avedon. I’ve yet to write about Avedon, but check back and I’ll update when I do. One of my long-time favorites, thanks to Alexander Calder’s kinetic sculptures – better known as mobiles. Calder studied engineering and designed toys when he was younger. After becoming established as an artist, he was commissioned to design everything from wraps for airplanes and a BMW to jewelry. Alexander’s grandfather, father, and mother were all noted artists, so this surname has quite a bit of artistic surname name style. It’s originally a place name, found in Scotland and England. 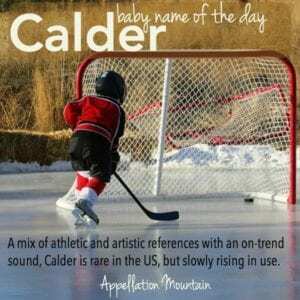 While I think it feels artistic, it’s equally well-known as an ice hockey name, thanks to Frank Calder, the first president of the National Hockey League, for whom the Calder Cup and Calder Memorial Trophy are named. Read more about Calder here. I probably first stumbled on Cassatt while looking for formal names for Cassie. It’s an obscure surname, but the most famous bearer is well known: painter Mary Cassatt. American by birth, she moved to Paris in the 1860s and would eventually become part of the Impressionist movement. Her works are notable for depicting women, especially mothers and children. Cassatt has no history of use as a given name, but feels like a marriage of Cassandra and Juliet, or maybe a masculine form of any of the Cass- names. I can imagine a Cassidy with a son called Cassatt. I’ve yet to write about Cassatt. Check back, and I’ll update when I do. Paul Cezanne is often credited with bridging the nineteenth and twentieth centuries in art. He studied with Impressionist Camille Pissarro, but his work evolved into something new. He’s especially known for his still lifes, and his focus on geometric form would inspire artists like Picasso. 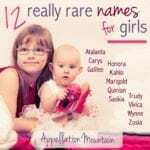 As a given name, Cezanne is slightly more common than some on this list – there’s some history of use, though it’s very rare. 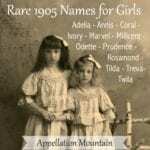 I can count about three dozen girls given the name since the 1960s. And yet, Cezanne illustrates why artist baby names can work so well. 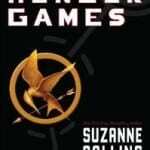 It’s got that great ‘z’ sound, is familiar but exotic, and would likely be seen as a positive, creative choice. I’ve yet to write about Cezanne, but check back and I’ll update when I do. Frida Kahlo is among the most famous female artists of the twentieth century, thanks in part to Salma Hayek’s much-lauded turn as the artist in biopic Frida. 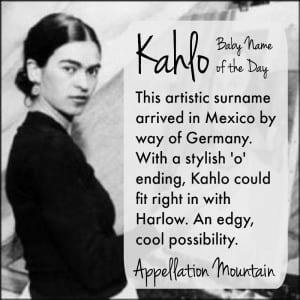 Kahlo’s father immigrated to Mexico from Germany, making the name an interesting mix of cultures, one with origins I couldn’t trace. With that bright ‘o’ ending, Kahlo feels like a more daring alternative to Arlo or Cleo. Since the artist is female, I tend to hear this name the same way. But so far, the very few Kahlos tend to be boys. Maybe that’s because it sounds quite a bit like boy names, from Kylo to Karl. It’s a powerful, vivid name, and one that works equally well for a son or a daughter. Read more about Kahlo here. Colorful Matisse probably traces its roots to Matthew, via Matthias, which became the surname name Mathis in French. 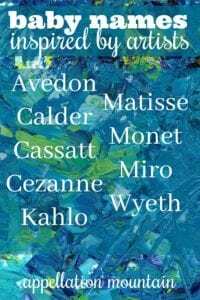 While Avedon or even Calder might not be instantly recognizable, Matisse’s works are so well known that it immediately brings to mind the bright, vibrant images of the artist. 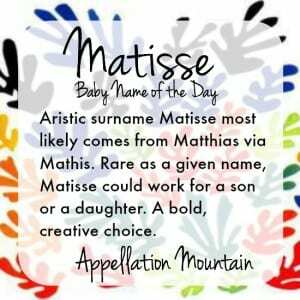 Mat- names are close to Mad- names, and so very accessible, making Matisse a sound-cousin to names from antique Matilda to modern Maddox. Matisse is used in almost equal numbers for boys and girls over the last century, though it is quite rare – and lately is slightly favored for boys. It’s creative, but accessible, the kind of name many parents seek. Read more about Matisse here. 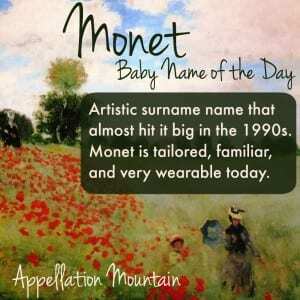 Monet is probably the most popular on this list of artist baby names, peaking as a given name for girls in the 1990s – though it never quite cracked the US Top 1000. Claude Monet was one of the founders of Impressionism, and his artwork is widely known and easily recognized. The surname comes from personal names ending in the sound, like Edmond. Monet also feels like a girl’s name in the key of other French choices like Renee and Desiree. The phonetic respelling Monae saw some use, too. In the 1990s, it lagged behind Monet. But today, thanks to the popularity of singer and actor Janelle Monae, born Janelle Monae Robinson, it’s slightly more popular than the original. Read the full post on Monet here. Artist Joan Miro was a Surrealist painter and sculptor. He was born in Barcelona, in the Catalonia region of northern Spain. The name’s roots are elusive. It might come from a given name. Mireia is a Catalan feminine given name, borrowed from an Occitan name invented by a nineteenth century poet, and best known to us as the more modern French Mireille, from the Latin mirar – to admire. This makes them cousins to Shakespeare’s Miranda. Lucy Lawless has a son named Judah Miro. It makes a bold and unexpected middle, but given our love of o-ending names, Miro works every bit as well as a first, for a daughter or a son. I’ve yet to write about Miro, but check back and I’ll update when I do. Andrew Wyeth is among the best-known painters of the mid-twentieth century. His most famous work, Christina’s World, is even spoofed in The Simpsons. For years, I might have judged Wyeth less than usable, thanks to pharmaceutical company Wyeth, the makers of household names like Advil and Robitussin. But the company has since been sold, and that helps make Wyeth feel more wearable. It also seems ike a creative spin on Top 100 favorite Wyatt. And, hey – I’m a sucker for the ‘th’ sound in names. Here’s a trivia point: four of these names are Mazur siblings. There’s actress Monet Happy Mazur, plus Cezanne, Matisse, and Miro. Matisse is a brother; I’m not sure about Cezanne and Miro. There’s also a cousin named Epic. That’s quite the family tree! Would you consider any of these artist baby names as a first or a middle? Are there other names that I’ve overlooked that should be on this list? Originally published on June 12, 2015, this post was revised substantially and re-posted on June 25, 2018. I’m an Art Teacher, but I prefer the artist’s first name for naming people (but generally surnames do not appeal to me anyway), with some of my favorites being Alphonse (for Alphonse Mucha), Artemisia (for Artemisia Gentileschi), Claude (for Claude Monet), Caspar (for Caspar David Friedrich), and Zinaida (for Zinaida Serebriakova). Though my son received an art and literary middle name Dante, for Dante Alighieri and Dante Gabriel Rossetti (who was named after Alighieri). Calder sounds perfectly acceptable to me similar to Logan. Yves Klein is one of my favourite artists in terms of his Art, History and the story behind him he was well ahead of his time, Yves would be interesting or even Klein. One of my daughter’s preschool classmates was an adorable little boy named Dali. Frederic Remington was THE sculpter who captured the Wild West in bronze. His works are easily identifiable and masterful. Nowdays, Remington is closely associated with the gun, but it has an artistic bent, too. Remy works for either gender (according to the stats). I know a Cyan whose father is a graphic designer… it’s not the name of a famed artist, but it is artistic. There’s a teen at school whose middle name is Monet; her parents are art lovers. Both wear well on the girls! Rex Roy is one of my favorite artists; we’ve considered naming a son after him. That’s a really good addition to the list, Arianna! An old friend of mine has a son named Wyeth. His older sister is named Calliope. Yes, the mother’s an artist. I have always had a soft spot for Magritte, who is one of my favorite artists. “Magritte” sounds like a modern twist on Margaret, which is a family name. Excellent suggestion, Denisha! I think Magritte definitely feels like an update for Margaret/Margot/Marguerite. My best friend’s son is named Parrish after the artist Maxfield Parrish, and he was almost named Maxfield according to her. As for the names listed, I would use as either first or middle name, it would depend on any number of factors. I used to love Monet long ago, but now not so much. I would most definitely consider using Matisse, Calder, or Miro, especially Matisse and Miro. Either of them because my beloved maternal grandfather went by his middle name Michael, so an M name to honor him is all the better. Plus Miro makes a good alternative to the now oh so popular Milo, a favorite name of mine. As for Cassatt, while I love her paintings, and I wouldn’t balk at the name being used. I think cassette, probably because I have a huge collection of music cassettes. Cezanne, I am not much of a fan, of it as a name. I think Kahlo and Wyeth would be interesting choices but not names I would choose to name a child. I just thought of ‘Rodin” (pronounced “Roh-Dinn”) after the famous sculptural artist Auguste Rodin of many very famous pieces of renowned artwork such as “The Thinker” would work well for a boy, but could be unisex, too. I also have liked Pollack (pronounced “Paul-Lick” for some time after Jackson Pollack, the famous painter and innovator of a new method involving dripping paints onto large canvases. I think because of the light ‘a’ sound at the end, I think of it working better for a girl’s middle name! Oh, and I adore Matisse (it could also honor my wonderful older brother, Matthew, in a certain way as well! Honestly, I have liked the name Wyatt for about 15 years now and Wyeth appealed to me right away-until I immediately thereafter thought of the association with the pharmaceutical drug manufacturer company of the exact same name and spelling (Wyeth).